Mae Salong (แม่สลอง), also known as Doi Mae Salong (ดอยแม่สลอง) and officially called Santikhiri (สันติคีรี), is a village in Chiang Rai Province, Northern Thailand. Mae Salong's early history centred on the opium trade of the Golden Triangle. Its recent history was shaped by the 93rd Division of the Chinese Nationalist Army that refused to surrender to Chinese communists after the Nationalist Kuomintang government was routed in 1949. Unlike most of the unrelenting nationalists that fled to Taiwan in 1949, a force of 12,000 escaped from Yunnan to Burma and continued an insurgency against the Peoples' Republic. They were at first supported by Taiwan and the USA, but diplomatic shifts—which included US ambivalence towards the nationalists and improved relations between Burma and communist China—later led to the partial disbanding of the nationalist forces in Burma. While thousands left for Thailand in 1961, many remained in Burma. The soldiers that settled in Mae Salong kept it as a military base in preparation for an eventual counter-attack against communist China. They funded their arms purchases with opium production and rubbed shoulders with notorious Burmese warlord and drug baron Khun Sa, who lived a few kilometres away in Ban Hin Taek and who initially trained with the Kuomintang before founding his own army. In the 1970s the Thai government struck a deal with the renegades: the battle-hardened soldiers would help them fight Thailand's own communist insurgents in exchange for legitimacy and Thai citizenship. Part of their going straight involved the soldiers' cessation of opium production in favour of the cultivation of mushrooms and above all oolong tea, which is now Mae Salong's main product. Some guidebooks wax lyrical about today's Mae Salong as a miniature Yunnanese Shangri-La, but if you come with this image in mind you may be a little disappointed: at first glance, Mae Salong looks much like the little Thai town it is, predominantly populated with Hill Tribe people and relocated Thai much more than Chinese. Nevertheless, the crisp climate, the lingering Chinese influence (although much of it commercial more than endemic), passable native Yunnanese dishes and small hotels and guesthouses catering to visitors still make this a popular getaway, worth visiting even on a hurried day trip, but well worth stopping in overnight. There are several four-story modern hotels which capitalise on the first class views across the valley. In November, sunflowers bloom, but the peak tourist season is during December-February when the hills are alive with white plum blossoms and pinkish sakura cherry blossoms. It gets misty and cold during this time, so pack a sweater and decent shoes! Tea production gets into gear toward the end of this season, with the smell of roasting tea wafting through the streets, but the same haze and rising temperatures that affect the rest of northern Thailand are in evidence here too from March onward, and the rainy season from June to October is rainy indeed. There are two roads to Mae Salong: one from Pasang, a hamlet on the Chiang Rai-Mae Sai highway, and one from Tha Ton, on the northern border road from Chiang Mai. Both are scenic and very twisty — pop a pill beforehand if you're prone to motion sickness. From Chiang Rai, take a bus to Mae Sai (platform 5) and ask to be dropped off at Pasang/Mae Salong. The trip costs 25 baht and takes approximately an hour. (Beware: there's another Pasang to the east of Chiang Rai, signposted at platform 9, but this will take you in entirely the wrong direction!) At the Pasang T-junction, there are blue songthaews that cost 400 baht total to go to Mae Salong (they'll ask 480+ to start, and will fairly readily go to 400 baht but never lower; Feb 2018), divided by the number of people waiting. Try to get here as early as you can, since otherwise, especially in the off season, you'll be looking at a long wait. An even better option is to take the same bus mentioned above and ask to be dropped off at the market in Mae Chan. There are four scheduled songthaews from there to Mae Salong daily at 07.30, 09.00, 11.00 and 13.00. The cost is 60 baht and may involve a change in vehicle at the half way point, in which case the fare is 30 baht (as at December 2011) for the first half, and then you'll pay 30 more for the second green songthaew. Green songthaews back to Mae Chan/Chiang Rai leave town at 7, 9, 11, 1, and 3, starting at ShinSane guesthouse and picking up through town (Jan 2014; same times & prices Feb 2018). From Tha Ton, there are yellow songthaews that go directly to Mae Salong. They leave at 0830, 1030, and 1230 for 60baht from a station on the right around the curve on the north of the bridge. Can be chartered for 600 baht at other times. This also offers an alternative route for Chiang Rai and Mae Sai: coming back, take the yellow songthaew to the Tha Ton-Mae Chan road (30 baht), hop aboard a Tha Ton-Mae Chan green songthaew to Mae Chan (another 30 baht), and then take the Chiang Rai-Mae Sai bus. This sounds complicated, but is probably faster than waiting for the "direct" songthaew to fill up. From Chiang Mai there are buses to Tha Ton. For the return trip, both colors of songthaew hang out at the 7-11 in the centre of town. (Feb 2018: We caught these at the ShinSane as well; yellow goes all the way to Tha Ton, green stops at the intersection for Mae Chan and you switch. These prices are still accurate). They stop running around 17:00, but in a pinch (or if in a hurry), the motorcycle cabbies can ferry you to Pasang for 300 baht. 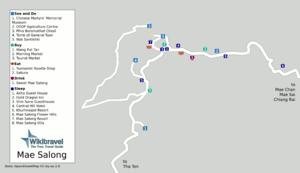 The shorter route is via highway 1089 from Mae Chan (near Chiang Rai) towards Tha Ton (to Chiang Mai). The signposted turn off is next to a police station. From here travel about 13 km on some of the most amazingly curvy roads imaginable. The return trip to Mae Chan can be undertaken on routes no. 1234 and no. 1130 which wind through Yao and Akha hilltribe villages; you can also make a diversion north to visit the royal development projects and villas of Doi Tung. Mae Salong is quite spread out, and while you can cover the central sights on foot, it is very convenient to rent a motorbike to wander around the hills and valleys. Renting fee is about 200 baht per day. However, bikes come with empty tanks, so you need to re-fuel first! There are many tribal villages (mostly Akha) within easy reach of Mae Salong, and local guesthouses can arrange treks in the area, either on foot or by horse (400 baht for 4 hours). The friendly owner of Little Home guesthouse can tell you about treks of approx 16km in the area, he also has an approx map that you can take on the hike. Especially the trek towards Baan Samsung is worth the hike. The long walking loop to an Ahka village, Jabusi village, and then back up to Ban Klang was also on his map, and a very fun day of exploring. If you're looking for a spectacular view and a short hike, follow the signs to the Wang Put Tan tea plantation and park by the giant statues. The thing to buy in Mae Salong is the excellent local oolong tea, grown on plantations all around. 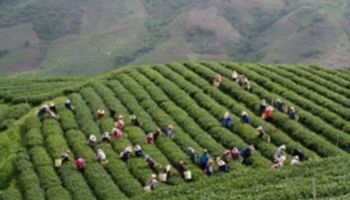 The tea bushes here were originally imported from Taiwan, well known for its high mountain (gaoshan) teas grown in a very similar subtropical climate. As well as tea itself, tea sets from China, as well as candies, fruits, and everything else you'd need for enjoying tea Chinese style, are also available. For Akha handicrafts, Yunnanese street snacks and cheap Chinese imports, check out the two markets in town. Bamboo worm for the brave. Deep fried and dried, it tastes like crispy cookie. There are a large number of noodle shops around town. Opposite Little Home guesthouse is a small restaurant (red Chinese lanterns hanging outside) that's worth stopping by for dinner. Try their fried rice with mushrooms to taste another version of Thai fried rice (vegetarian). Aside from a few dogdy karaoke enterprises, there is virtually no nightlife in Mae Salong. Drink tea instead! Or, if you're feeling frisky, sample any of the numerous Chinese liquors with unfortunate pickled bugs and snakes inside. Outside peak season, supply tends to exceed demand and prices are usually negotiable if not resulting directly in half price. (Price indicated below are updated on December 2014). On the main road you can spot 2 fields suitable for camping: one is as you see the city sign Mae Salong, and the other one is 5 minutes walking after the 7/11 on the left (spectacular view on the valley and tea plantations). Basic toilets on site but possibly no charge. Any opium warlord action has long since moved to the Myanmar side. Still, this is a border area, so don't go trekking too close to the boundary and keep your papers with you, since there are plenty of police checkpoints around. This page was last edited on 30 March 2018, at 10:53.